For many the retirement age is a thing of the past. Many people have continued to work well past the age that was once thought of as a set date on when to begin enjoying the retired life. This includes the priests of the diocese. Though they submit their resignation at age 75, that does not mean they forget their calling. Most continue their parish duties but some go well beyond that call. Two of those men are Msgr. John Bracken of Blessed Trinity, Breezy Point, and Msgr. 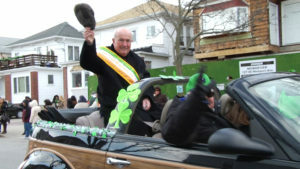 John Casey of Our Lady of Lourdes, Queens Village. Both men have continued to work and serve both their parishes and the diocese during their retirement ages. Msgr. Bracken will turn 78 this coming November and in June of this year celebrated his 51st year as a priest. He was ready to retire but then the bishop called and asked for a favor. Then Superstorm Sandy hit and more favors were asked of Msgr. Bracken, but he was happy to help. “Well, actually I was preparing for retirement and went on a sabbatical to the Holy Land, which was wonderful, but when I came back Bishop [Nicholas] DiMarzio asked me to be a temporary pastor and I was telling people I was only here a short time. “After I extended my stay a few months already they did find a new pastor in Father Jim Cunningham. But he was coming from a parish in Far Rockaway and the Bishop told me he had no one to go there and so he asked me to go. I was there for about a year and retired to live at Our Lady Help of Christians. Retirement is easy I have done it many times. Msgr. Bracken is now back at Blessed Trinity and continuing to serve the parish of three churches as best he can, but he is also enjoying it as much as he can. Msgr. Bracken shared the news with his friend, Msgr. Joseph Nagle who said he’d be willing to live there as well. Msgr. 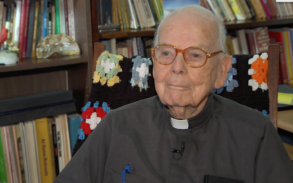 John Casey was ordained in 1954 and will turn 90 in December. Currently at Our Lady of Lourdes, he continues to work and stay active in the parish community. It was not hard to retire, he said, because he knew his work was not over. Many tasks were only just beginning. Several priest friends were also going through the same experience in their lives, which was helpful, he said. Msgr. Casey is happy to still be a part of the lives of so many parishioners. He began his priesthood at St. Patrick’s in Long Island City and was even a Little League coach. Today, he might not be able to get on the baseball diamond anymore, but he stays in touch the best way he can. Both monsignors have continued to work because they love what they do and feel the need to continue to answer the call. The other side is that there is a great concern for the future of the church and the priesthood. As seminary classes grow smaller in size, older and retired priests have been asked and are expected to do more. On this, Msgr. Bracken says Blessed Trinity parish is the perfect example. “If it wasn’t for the retired priests, then we would not be able to serve and provide for as many people and have as many Masses as we do,” he said.